The Buddhist Temple or Brahma Vihara Arama in Dencarik is Bali’s largest Buddhist monastery. 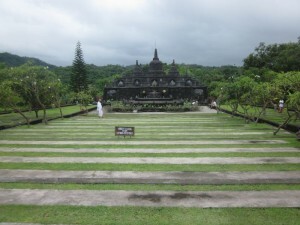 The monastery is absolutely charming and has lovely views down to Lovina and across the Bali Sea. Whilst obviously Buddhist with its orange roof, numerous gold Buddhas and stupas recalling those at Borobudur, the carvings and ornamentation are very Balinese. A visit here combines well with Banjar Hot Springs. It is free to enter the temple, but donations are welcome. Last updated by Ammanda Naibaho at January 31, 2014 .